SQL SELECT fetches data from database in the form of a set of rows called resultset. Here, the columns can be a single column or multiple or all. If it is a single column then we just write the column name. If we want to select multiple columns then we need to write columns separated by a comma. I know you are lazy like me.  Are you thinking is there a shortcut way to fetch all columns data from a table? Guess what!! Yes. We can do so by using * instead of column names. Let us say we want to fetch all rows from jobs table. Please note that the jobs table is in oracle hr schema. Here is the screenshot for the same. We have used column names separated by the comma in this example. 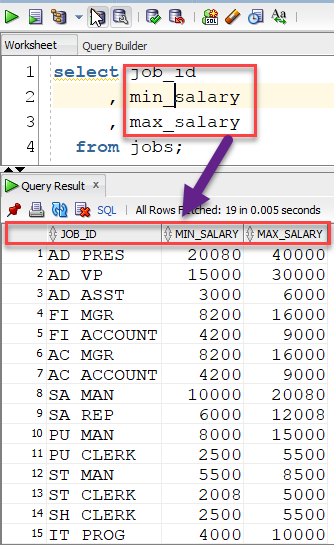 So, this SQL SELECT statement fetches job_id, min_salary and max_salary from the jobs table. Tell us in the comment below if this post is useful or you have any doubt on this SQL Tutorial.